What is Natural Look® Technology? A drawback of artificial grass compared to natural grass is that it can sometimes appear to look different depending on lighting conditions and the angle it is viewed from. Our products that utilise this ground breaking Natural Look® Technology ensure that your lawn will look as realistic as possible, from every angle. How Does Natural Look® Work? Synthetic fibres are reflective by nature due to their smooth/polished appearance. The smoother a surface, the more light it will reflect. This reflection causes glare that makes artificial grass appear different when viewed from different angles. Through extensive research we have pioneered a revolutionary method in reducing the reflective properties of our artificial grass. When viewed at a microscopic level, our Natural Look® fibres have a rough surface that helps to disperse light rays with less reflection. This provides a natural look and colour from every angle, in every environment. 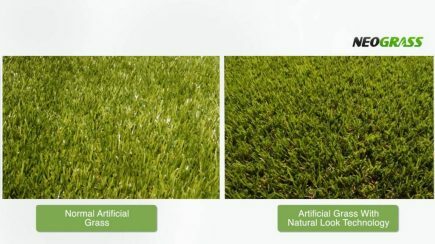 Be sure to choose Natural Look® Technology for the most realistic artificial lawn.